Sure, a lot of people love the idea of a spring or summer wedding – and that’s perfectly fine. However, it’s not a rule – so if you want to have a winter wedding you should totally go for it. 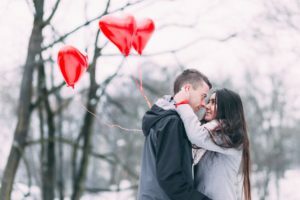 Even more, you should make sure to make your winter wedding SHINE with uniqueness and personality – and yes, music should totally be included in this plan. So, what are some of the best song ideas for a winter wedding? We have some tips for you – continue reading if you want to find your inspiration. •	Mariah Carey, All I Want for Christmas Is You. Undeniably, one of the most popular modern Christmas songs ever created. A love tune that will melt your heart every time, a voice you simply cannot ignore, power, love, romanticism, and winter – all rolled into a song every single guest at your wedding will recognize, from your 70-year-old grandma to your 14-year-old cousin. •	Sara Bareilles and Ingrid Michaelson, Winter Song. Cute, quirky, romantic – these are the best three words to describe this quintessentially winter-like song. A tune that will be highly appreciated even by people who have never listened to it. A song that’s just perfect for a quirky couple who wants to stand out from the crowd. A genuinely great choice for a winter wedding! •	The Doors, Wintertime Love. In love with the sound of the 60s? The Doors is one of the best bands to go for if that’s what you want for your Big Day. Unique and remarkable, their music will complement you if you want to offer your guests a truly original experience – and this particular song by The Doors is really amazing for a winter wedding (the title pretty much says it all, right?). •	Billie Holiday, I’ve Got My Love to Keep Me Warm. There’s nothing not to love about this song or Billie’s voice. Soothing and romantic, lovely, unforgettable – her music will go straight to your soul and warm it up against the chilly weather outside. The perfect tune for a cozy and romantic atmosphere! Looking for a brilliant wedding DJ in the Metro Detroit area? Contact Memory Maker DJs and allow us to be the ones who delight your wedding guests with the BEST music and the best mixes. Contact us and we guarantee you will NEVER regret your choice!